Steve has got over 23 years' engineering experience that covers tool making, grinding, cutting, CNC operator, man management and has ran his own business since December 2002. The current workforce has been with Steve for more than 17 years and this level of loyalty has helped form the high service levels experienced by CNC’s partners. Following more than three very successful years based at Gainsborough Trading Estate in Stourbridge, CNC Technology has moved into new premises that are double the size of the old one to accommodate the growth the business is experiencing. Based in Victoria Works, Maypole Fields, Cradley Heath, B63 2QB the new unit is modern, clean and is now open for any customers or prospective customers to visit. 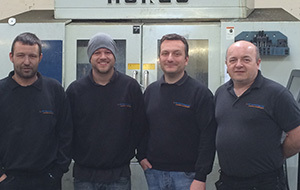 As of October 2014, CNC Technology has already invested in additional machinery, engineers and a trainee engineer to ensure service levels are maintained as the customer base expands.